Revitalised team’s performance against South Africa did us proud. With all of Scotland’s injury problems and call ups to the Lions, I was expecting that South Africa would put Scotland to the sword after last week’s performance against Samoa, but how wrong can one be? Scott Johnson blooded three new caps and all three performed brilliantly, as did their team-mates. Alasdair Strokosch was quite outstanding a thorn in the Springboks side in both attack and defence, he played as if his life depended on it as many others did as well. All Scotland’s defensive frailties that were exposed by the Samoans a week before were shored up. More often than not, defending is about having the right mind-set, being aggressive and putting your body on the line where it is likely to be hurt and everyone in a Scottish jersey did just that. Scotland were transformed at the contact areas and competed for everything, yet without becoming ragged or losing their structure. 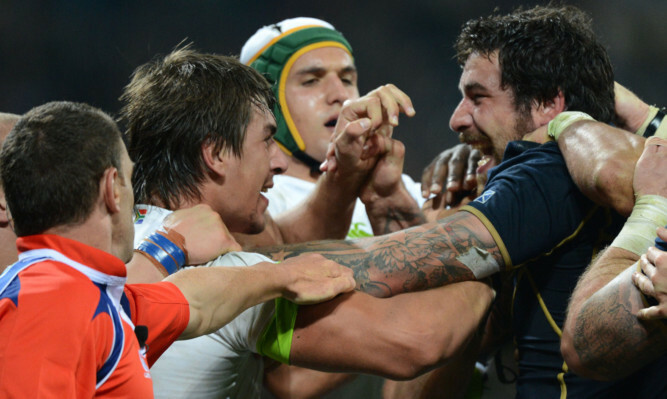 The Springboks simply could not cope for long periods of the match. What’s more, Scotland were a different team in attack. Gone was the turgid phase play and big forwards taking ball up into contact. Instead the Scots put pace on the ball and off-loaded more than they have done in years and what a difference it made. It felt as though they made more line breaks in this match and played more rugby than they had done in the whole of the last Six Nations and in the end, the margin of defeat was a travesty and wholly unrepresentative of the match. In many respects, Scotland played the sort of game that was played years ago, which was the hallmark of the Scottish game. It was urgent and intense and, while mistakes were made, it was brilliant to watch and it must have been great to play. From 1 to 15, every player looked for opportunities to break down the South African defence and this Scotland team, shorn of many of its’ regular players, did it’s fans proud. Scotland weren’t helped by the referee at times and Jim Hamilton’s yellow card for a push on his opposite number was utterly ridiculous. It shifted the momentum of the game away from Scotland which they then found hard to recapture. It was a performance to be proud of and if there is one word of criticism, it is that this inconsistency is incredibly frustrating. One can only hope Scotland pick up from where they left off against Italy next weekend to finish on the high they deserve.